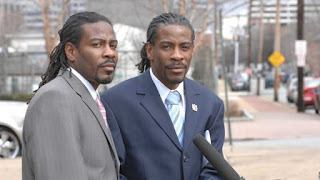 Delaware Arts Info: Congratulate & Welcome Delaware's New Poets Laureate: The Twin Poets! Congratulate & Welcome Delaware's New Poets Laureate: The Twin Poets! Delaware Arts Info is happy to celebrate spoken-word artists Al Mills and Nnamdi Chukwuocha --- known regionally as The Twin Poets --- as the First State's new Poets Laureate. As Delaware's 17th ambassadors of poetry, they are also the first to share the honorary title. The 45-year-old identical twin brothers have been writing since they were children. Their prose have been featured on HBO’s Def Poetry Jam and NPR’s Poetic License, and the pair has won numerous awards and toured nationally and internationally as part of their craft. The duo were sworn in to their new appointments by Governor Jack Markell in a December 16 ceremony at the Delaware Art Museum. "You have got something to say that I think people need to hear," Markell said during the event. "People from all walks of life, who may not have ever come together otherwise, are going to hear this message." The two performed separate poems following the oath of office, with Mills reciting a new work entitled, The Beauty of the Journey. Mills and Chukwuocha hope not only to introduce children statewide to the art of prose but also to share their artistry through outreach to military bases, jails and prisons in Delaware. The Poet Laureate program is overseen by the Delaware Division of the Arts, which coordinates performances and associated programming for the the artists throughout the state. Both men are social workers, and Chukwuocha is a Wilmington city councilman. Their father was community leader William “Hicks” Anderson, for whom the center on Madison Street is named. See the Twin Poets perform on HBO's Def Comedy Jam.